Boss Capital are no longer trading. For a list of alternative brokers, and full comparison reviews, visit our brokers page. Boss Capital is one of the newest brokers on the market. This broker was founded in 2014 and is headquartered in Gibraltar. The broker is built on the Tech Financials platform and offers a decent trading package. This isn’t the best broker I have ever seen but it isn’t the worst either. They have a decent asset list, good options, adequate expiry and decent terms but no one feature that makes this a must-use broker. On the bright side it is a good choice for us U.S. based traders who are having our options, no pun intended, dwindle. 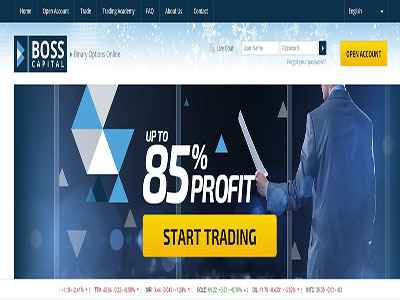 If you are not familiar with Tech Financials it is one of the leading providers of binary options platform solutions and white label brokerages. Bonuses are available from Boss Capital. The standard account is eligible for a 30% bonus with that amount growing as your initial deposit grows. Executive accounts, over $5,000, can get a bonus over 50%. The trade minimum is 30X the bonus amount and this must be met before you can make any type of withdrawal. This is pretty standard for the industry and one of the reasons why I don’t recommend bonuses as a rule. Boss Capital uses the Tech Financials platform. It is one of the leading platforms but I don’t like it as much as some others like SpotOption and even proprietary platforms like Anyoption. However, it is not all bad. Mostly what I don’t like is the look and the lay out. It’s a little busy and not quite user friendly, at least when compared to other top brokers. Moving past may aesthetic criticisms lets look at what the platform has to offer. The asset list is quite large and when I checked for live trading most were available. There are over 200 in total with more than 25 indices, a dozen currency pairs, 8 commodities, 14 pairs trading and over 100 stocks. The indices include all the major U.S., EU and Asia-Pacific indices and things like Bombay, Dubai and Moscow. Currency pairs include all the most heavily traded currencies and Bitcoins. The commodities include gold, silver, copper, platinum and coffee, wheat and sugar. There are not too many extra’s here. BossCapital has an early closure feature available for some trades but that it not so special anymore. Their banking system is good. I like the way they reward traders for having higher balances. The standard account is OK when compared to the average broker but the services get much better as your account grows.